Pikes influence on contemporary Freemasonry is the topic of some debate both within and outside the Craft. 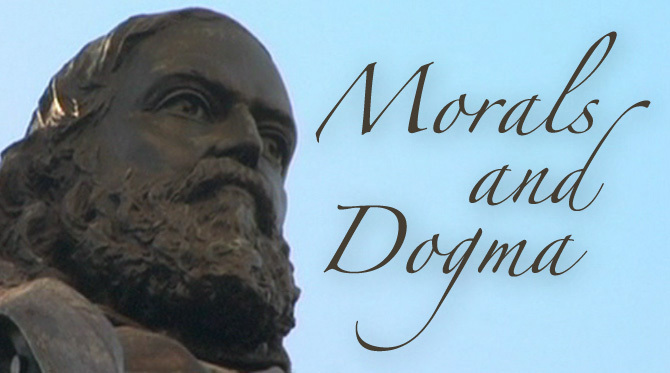 His Morals and Dogma of the Ancient and Accepted Scottish Rite of Freemasonry has often been quoted, misquoted and taken out of context by both anti-masons and misled non-masons. Pikes extensive references to the symbolism, practices and beliefs of religious schools through history and around the world can, unfortunately, lead the careless reader into a mistaken idea of what constitutes Freemasonry. Pike is not always consistent in his use of some terms and he is, of course, a product of his time and place in history. Pike cannot act as representative of contemporary Freemasonry but this text is a valid and valuable introduction to the symbolic values that history placed on the metaphors and allegories of masonic teachings. The following quotes 1 do not include any of his more obscure and esoteric references, many derived from Éliphas Lévi and his Dogma de la Haute Magie.2 They will, though, show that Pike did not view Freemasonry as a religion, luciferian or otherwise. That he also does not present himself as an authority will be shown by the first of the following quotes from his text. as a poet, was most distinguished, and his untiring zeal was without a parallel. ... contrary to the impression Masons have had, Pikes time, thought, and writing were not absorbed by the Fraternity. No man truly obeys the Masonic law who merely tolerates those whose religious opinions are opposed to his own. Every mans opinions are his own private property, and the rights of all men to maintain each his own are perfectly equal. Merely to tolerate, to bear with an opposing opinion, is to assume it to be heretical; and assert the right to persecute, if we would; and claim our toleration of it as a merit. The Masons creed goes farther than that. No man, it holds, has any right in any way to interfere with the religious belief of another. It holds that each man is absolutely sovereign as to his own belief, and that belief is a matter absolutely foreign to all who do not entertain the same belief; and that, if there were any right of persecution at all, it would in all cases be a mutual right; because one party has the same right as the other to sit as judge in his own case; and God is the only magistrate that can rightfully decide between them. To that great judge, Masonry refers the matter; and opening wide its portals, it invites to enter there and live in peace and harmony, the Protestant, the Catholic, the Jew, the Moslem; every man who will lead a truly virtuous and moral life, love his brethren, minister to the sick and distressed, and believe in the ONE, All-Powerful, All-Wise, everywhere-Present GOD, Architect, Creator, and Preserver of all things, by whose universal law of Harmony ever rolls on this universe, the great, vast, infinite circle of successive Death and Life:to whose INEFFABLE NAME let all true Masons pay profoundest homage! for whose thousand blessings poured upon us, let us feel the sincerest gratitude, now, henceforth, and forever! From the political point of view there is but a single principle, the sovereignty of man over himself. This sovereignty of ones self over ones self is called LIBERTY. Where two or several of these sovereignties associate, the State begins. But in this association there is no abdication. Each sovereignty parts with a certain portion of itself to form the common right. That portion is the same for all. There is equal contribution by all to the joint sovereignty. This identity of concession which each makes to all, is EQUALITY. The common right is nothing more or less than the protection of all, pouring its rays on each. This protection of each by all, is FRATERNITY. Liberty is the summit, Equality the base. Equality is not all vegetation on a level, a society of big spears of grass and stunted oaks, a neighborhood of jealousies, emasculatillg each other. It is, civilly, all aptitudes having equal opportunity; politically, all votes having equal weight; religiously, all consciences having equal rights. The true Mason labors for the benefit of those who are to come after him, and for the advancement and improvement of his race. We do not undervalue the importance of any Truth. We utter no word that can be deemed irreverent by any of any faith. Masonry, of no one age, belongs to all time; of no one religion, it finds its great truths in all. 1. All quotes excerpted from: Morals and Dogma of the Ancient and Accepted Scottish Rite of Freemasonry by Albert Pike, prepared for the Supreme Council of the Thirty Third Degree for the Southern Jurisdiction of the United States: Charleston, 1871. 861pp. page numbers noted in brackets. 2. The Supreme Council, 33° Mother Council of the World Ancient and Accepted Scottish Rite of Freemasonry, Southern Jurisdiction, U.S.A. Charles S. Lobingier. Louisville : The Standard Printing Co., 1931. Chap. xiv pp. 339-46. 3. Encyclopedia of Freemasonry. Revised by Robert I. Clegg. Richmond, Virginia: Macoy Publishing, 1966, p. 774. 4. Supplement to Mackeys Encyclopedia of Freemasonry. Richmond, Virginia: Macoy Publishing, 1966, p. 1334.